Smart materials are used to develop more cost-effective and high-performance water treatment systems as well as instant and continuous ways to monitor water quality. Smart materials in water research have been extensively utilized for the treatment, remediation, and pollution prevention. Smart materials can maintain the long term water quality, availability and viability of water resource. Thus, water via smart materials can be reused, recycled, desalinized and also it can detect the biological and chemical contamination whether the source is from municipal, industrial or man-made waste. 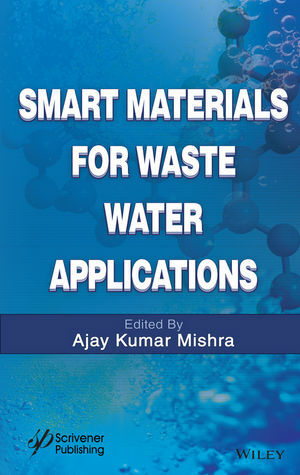 The 15 state-of-the-art review chapters contained in this book cover the recent advancements in the area of waste water, as well as the prospects about the future research and development of smart materials for the waste water applications in the municipal, industrial and manmade waste areas. Treatment techniques (nanofiltration, ultrafiltration, reverse osmosis, adsorption and nano-reactive membranes) are also covered in-depth. The chapters are divided into three groups: The first section includes the various carbon nanomaterials (such as carbon nanotubes, mixed oxides) with a focus on use of carbon at nanoscale applied for waste water research. The second section focuses on synthetic nanomaterials for pollutants removal. The third section highlights the bio-polymeric nanomaterials where the authors have used the natural polymers matrices in a composite and nanocomposite material for waste treatment. The large number of researchers working in the area will benefit from the fundamental concepts, advanced approaches and application of the various smart materials towards waste water treatment that are described in the book. It will also provide a platform for the researchers and graduate students to carry out advanced research and understand the building blocks. Ajay Kumar Mishra is currently working as the Director at the Centre for Nanomaterials Science and also as an associate professor at the Department of Applied Chemistry, University of Johannesburg, South Africa where he is a group leader of the research area for the composites/nanocomposites, water research and bio-inorganic chemistry.